Melissah Yang, Neon Tommy Annenberg — As cargo volumes increase at the Port of Los Angeles, Chinese shipping firms are investing in nearby logistics companies to secure their global supply chains through the city’s seaports, the United States’ gateway for Asian goods. Since 1961, family-owned Carmichael International Service helped Asian companies bring their products, from shoes to footrests, into the U.S. But the game changed as more and more clients went global. The Los Angeles-based customs brokerage firm found itself competing against overseas companies that already had U.S. holdings and didn’t need its services. 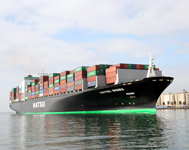 This entry was posted on October 28, 2013 by News in Port of Los Angeles and tagged Cargo ports, Port of Los Angeles, US Ports.